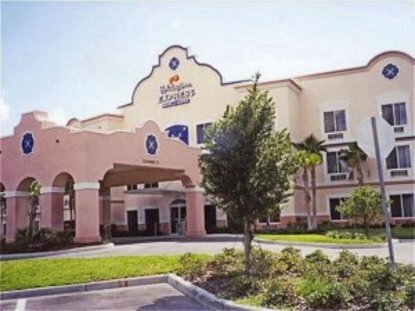 The Holiday Inn Express Hotel & Suites The Villages is conveniently located in The Villages, the friendliest home town in central Florida. Our beautifully decorated hotel has 80 spacious rooms all of them containing hair dryers, personal coffee makers, iron & ironing boards. Our large, well lit work area has two phones with data ports as well as two phone lines. We offer a deluxe breakfast bar in our Great Room where there is coffee 24 hours a day. Best of all we are walking distance to town square where there are many fine restaurants, boutiques and nightly entertainment 365 days a year. This hotel is committed to providing accessible facilities under the American Disabilities Act. If your accessibility needs are not met, please contact the Hotel Manager on Duty. Should you require additional information regarding accessible facilities for guests with disabilities, please call 1-800-Holiday (U.S. and Canada) or contact the hotel directly. For the hearing impaired, TDD service is available at 1-800-238-5544 within the U.S. and Canada.